You can improve your relationship with Linda's help and support. Linda has vast experience in helping couples to overcome their difficulties, and specialises in this area, so call her today. Couples counselling, which was previously known as marital therapy or marriage guidance, addresses the problems arising from adult sexual or intimate relationships. The relationship, rather than the two individuals, is the 'client'. Destructive patterns of communicating and behaving can be recognised and addressed. 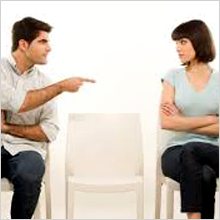 Psychosexual issues can highlight a problem within the relationship or arise from the past. Childhood sexual abuse, for example, can impact on an otherwise happy relationship and can be helped with Psychosexual therapy. Other sexual problems may have a physical or medical cause, but can often be addressed. Separation & divorce counselling can help explore whether trust can be repaired or the relationship will need to be rebuilt. If not, it can allow the couple to split with more understanding and less hostility. Call Linda on 0779 4647442 to ask any further questions or to book an appointment. You can also contact us via e-mail and request a call back using the contact page.